Home » Food and Nutrition » Diet » Is Aspartame Really Bad For You? Aspartame is highly controversial. The artificial sweetener has come under fire for all kinds of health hazards since its introduction into the marketplace—and it can definitely evoke strong feelings from both its detractors and supporters. This week Pepsi-Cola is stocking shelves with a new aspartame-free version of their Diet Pepsi. This move breaks the mold for the typical diet soda, which relies on aspartame to add the sweetness without the calories. But is Pepsi’s new recipe any healthier than its old one? Aspartame has been called “the most dangerous substance on the planet” and been anecdotally linked to a number of health problems and side effects. Some lab work has shown some scary results, but the same results have not been replicated in humans. So does aspartame deserve all the bad press? Let’s take a closer look at the medical side effects of aspartame. Aspartame is one of the most commonly used artificial sweeteners and is 200 times sweeter than sugar. Because of its intense, powerful sweetness, it’s used in a number of prepared foods and beverages as a way to add flavor without adding calories. It’s why you can have a Diet Coke or Coke Zero that tastes just like a regular Coke, but it has zero calories instead of 140. It’s also found in table sweeteners like NutraSweet and Equal, which are commonly added to coffee and other items. The controversy surrounding aspartame usually focuses on how it’s broken down and digested in the body. When you eat aspartame, it turns into three different compounds: phenylalanine, aspartic acid, and methanol. Although the names might look scary and toxic, phenylalanine and aspartic acid are amino acids. Amino acids are the building blocks of protein found in virtually every food you eat that contains protein, and to the average individual, cause no health problems; they are as natural as it gets. The real controversy surrounds methanol. Studies have shown that when consumed in high amounts, methanol can become toxic. But in order to hit these amounts, you’d have to consume more aspartame than you’d likely have the time—or desire to. In fact, the American Cancer Society says that drinking one liter of diet soda translates to roughly 55 milligrams (mg) of methanol being absorbed. The same amount of fruit juice, on the other hand, would provide 680 mg of methanol. Most “diet” or “sugar-free” options contain some form of artificial sweetener and in many cases, it’s aspartame. There are a number of reported aspartame side effects, but none of them appear to stand up to scientific analysis, and for the most part, are strictly anecdotal. It seems that in many cases, aspartame has been a scapegoat for a number of conditions. People have said it can cause minor side effects, like headaches, dizziness, digestive symptoms, and mood changes. More severe side effects like Alzheimer’s, birth defects, attention-deficit disorder (A.D.D. 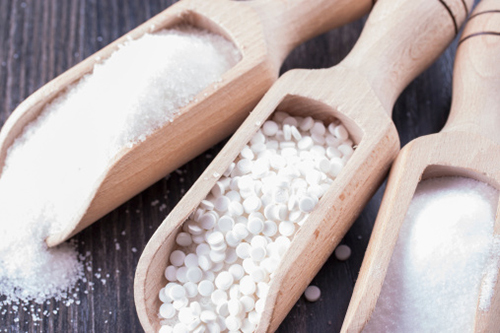 ), Parkinson’s, Lupus, Multiple Sclerosis (MS), and seizures have also been anecdotally linked—but no scientific research shows any connection between aspartame and these conditions. Aspartame is simply not as dangerous as many online pundits would like you to believe. There are two areas, however, where aspartame can have some serious health implications. The first is in people with a rare genetic disorder called Phenylketonuria. Aspartame can affect them because their bodies have trouble breaking down the amino acid phenylalanine. This very small group of people should monitor aspartame usage very closely. The other health implication is much more far-reaching and impacts many more people. One of the biggest knocks against artificial sweeteners is that they end up leading people to eat more. In turn, they can contribute to obesity and exacerbate the problems associated with obesity, like metabolic disorder, type 2 diabetes, and heart disease. Many people, for example, will order a super-sized meal and believe that ordering a Diet Coke will make a substantial dent in the calories they eat—this is simply not the case. If you’re using artificial sweeteners as a way to justify consuming more calorically-dense foods, you’ll experience virtually no health benefits. Artificial sweeteners are not health foods, but are cleverly marketed as such. Yes, sweetener is a low-calorie option, but it might stimulate cravings. Artificial sweeteners are also added to make “diet” junk food. No matter how you look at it, a cookie is considered junk food, whether it’s sweetened with aspartame or sugar. If you’re consuming a lot of products with aspartame, it’s likely not the aspartame that’s causing you any associated health problems, but rather your overall food choices. It’s an additive to processed food and the only real way to cut back on aspartame is to eat fresh, unprocessed foods. But if you’ve got a generally healthy diet featuring lots of fruits, veggies, whole grains, lean meats, and water, I wouldn’t be concerned at all about having the occasional diet soda or other artificially-sweetened treat. After all, it’s not as dangerous as sugar! American Cancer Society, “Aspartame,” American Cancer Society web site, May 28, 2014; http://www.cancer.org/cancer/cancercauses/othercarcinogens/athome/aspartame. “The Truth About Aspartame,” NHS Choices web site, last reviewed January 4, 2014; http://www.nhs.uk/livewell/goodfood/pages/the-truth-about-aspartame.aspx, last accessed August 13, 2015. Tandel, K., “Sugar Substitutes: Health controversy over perceived benefits,” Journal of Pharmacology and Pharmacotherapeutics, 2011; 2(4): 236–243.